A garnish of fresh pineapple makes for the ultimate combination of sweet and smoky in this Pineapple Pork Chili. Ground pork, pineapple salsa, fire roasted tomatoes and black beans mingle together to create a one of a kind, unforgettable chili. Original content posted February 2014. Updated January 2019. So at a past job when they held a chili cook-off competition for employees, I was one of the first to sign my name on the dotted line to participate. You likely already know how this story might end, as I sure wouldn’t share any instances of not winning with you! Instead, this Pineapple Pork Chili received top prize in the competition. Make it once and you’re sure to see why! My “everyday” chili, the one that I create on a fairly frequent basis during the cold winter months, is my Beer Braised Beanless Chili. But sometimes it’s good to shake things up and go with a recipe that’s a little less traditional. Something packed with unexpected flavors that work together so well, yet your mind can’t wrap itself around the idea of how it’s possible. Pineapple? Pork? Chili? Yes, please! 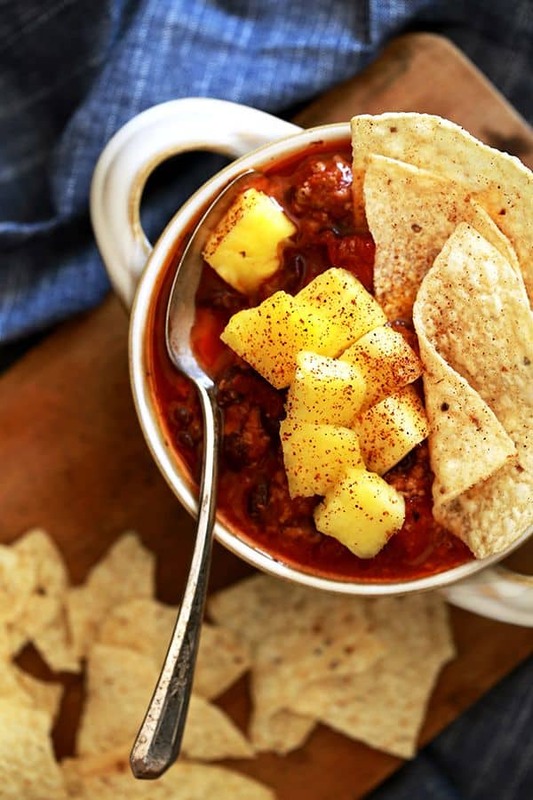 The fact that there is absolutely no chopping or prep work involved means that this Pineapple Pork Chili takes less than 30 minutes to prepare. But my favorite part? The part that is always the show stopper, although always given a quizzical first glance? The garnish of diced fresh pineapple on top. There’s something about the combination of sweet, juicy fruit paired with the smoky heat of the chili that keeps you coming back for more. Of course, you could enjoy this unique chili on it’s own, but it’s always better with a side! I typically choose to serve it alongside my Simple Sweet Cornbread or Cheddar and Cream Cheese Skillet Cornbread. 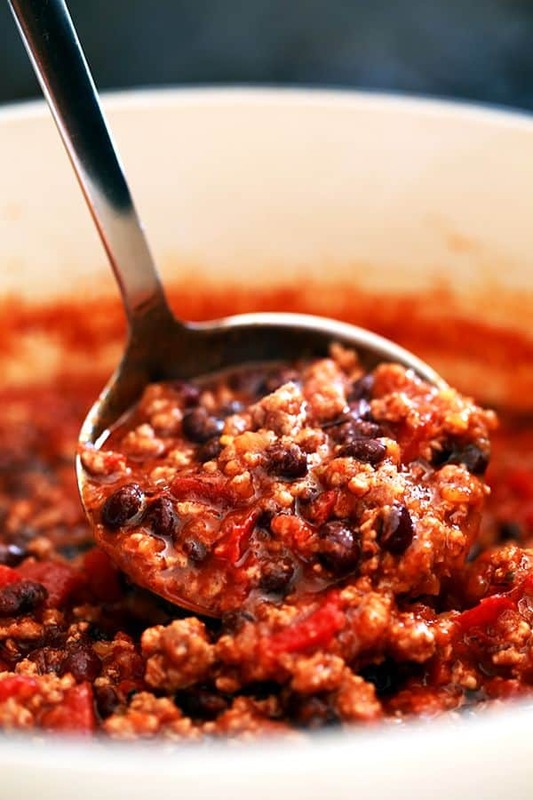 Both make an excellent side kick to this delicious chili. Add ground pork to large dutch oven or stock pot. Brown ground pork over medium heat. TIP: Not a fan of pork? You can also easily substitute ground chicken or turkey. Add salsa, black beans, tomato sauce, tomatoes and chili powder. TIP: Like a little more heat in your chili? I’ve also substituted mango habanero salsa for the pineapple salsa called for in this recipe with great results. Stir together. Bring to boiling and reduce heat to simmer uncovered for 10 minutes. 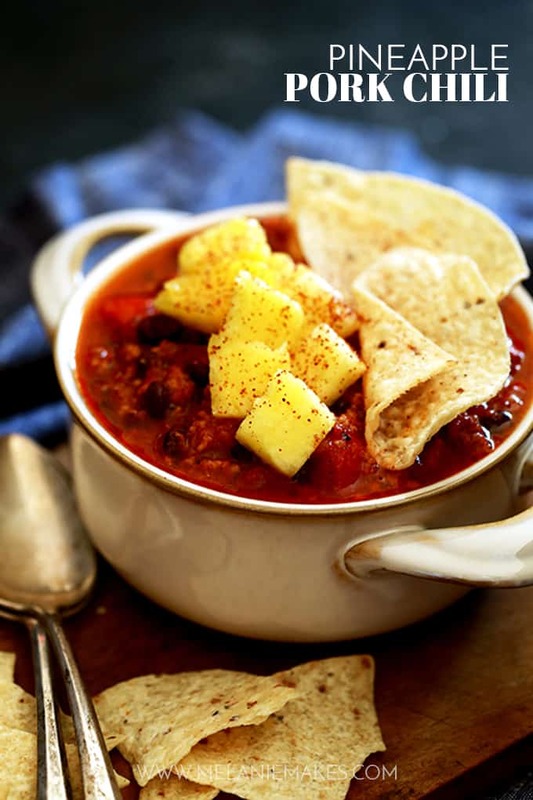 If you’ve tried this Pineapple Pork Chili or any other recipe on Melanie Makes, please let me know your thoughts in the comments below. I love hearing from you and respond to each and every comment! 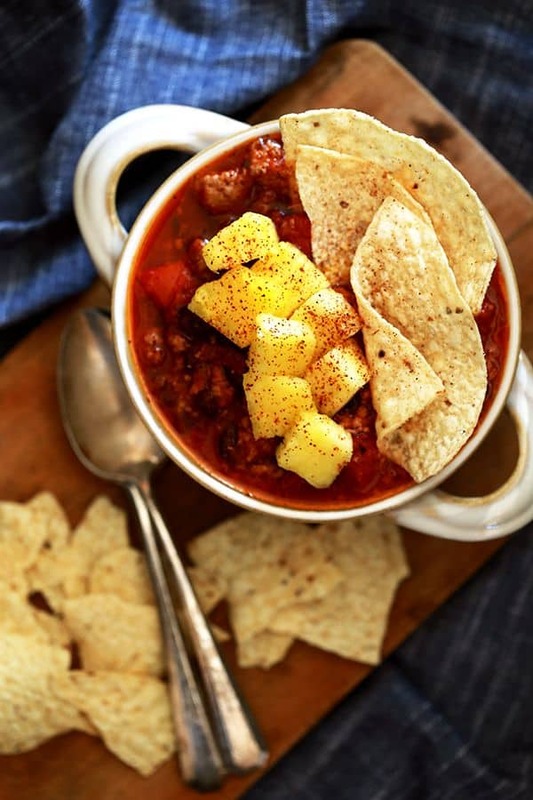 A garnish of fresh pineapple makes for the ultimate combination of sweet and smoky in this Pineapple Pork Chili. 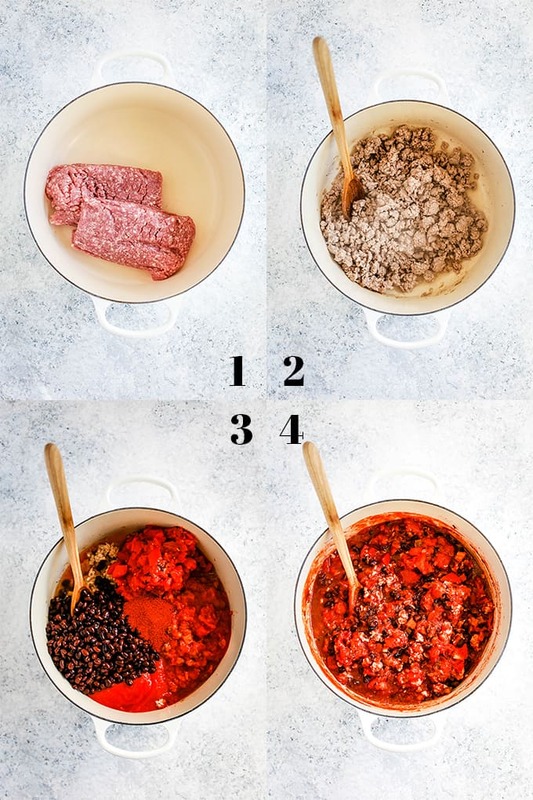 Ground pork, pineapple salsa, fire roasted tomatoes and black beans mingle together in a large pot to create a one of a kind, unforgettable chili. Bring to a boil and then reduce heat to simmer uncovered for 10 minutes. Served topped with fresh diced pineapple and tortilla chips, if desired.. TIP: Like a little more heat in your chili? I've also substituted mango habanero salsa for the pineapple salsa called for in this recipe with great results. 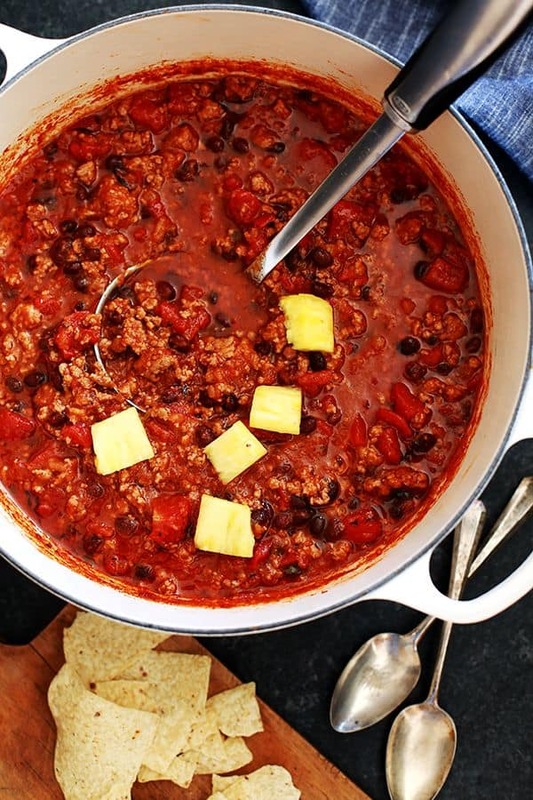 You have to have more than one chili recipe to have a chili cook-off! 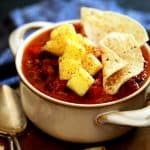 Why not pair my Pineapple Pork Chili with this one of a kind Dr. Pepper Chocolate Chili, this comforting Creamy Taco Chili or this super easy Instant Pot Chicken Chili. Thanks, Paula - it's one of my favorite chilis! Love the sweet flavors from the pineapple! Ultimate comfort food dinner for the win! I love the sweet flavor of the pineapple combined with the smoke roasted tomatoes. I can't wait to make this next week. I've never tried a sweeter chili before. In fact, I've never tried pineapple in my chili and it sounds SO good! It's such a fun sweet and savory combination, Shannon! Wow this pork is sooooo savory! This chili is delicious! I love the combination of pork and pineapple!